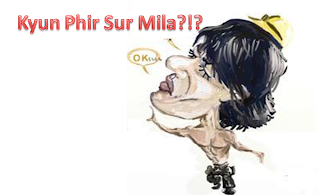 Neha's Blog: Kyun Phir Sur Mila? DISCLAIMER: THIS POST IS A WORK OF FICTION. I REQUEST YOU NOT TO TAKE THE POINTS MENTIONED HEREIN BELOW SERIOUSLY. WE LOVE OUR CELEBS AND WILL CONTINUE TO DO SO. I AM SURE ONE POST WILL NOT MAKE YOU HATE THEM (OR ME). It was the grand occasion of celebrating the Success of “Phir Mile Sur mera tumhara” and I had the pleasure to meet the celebrities who have done so much for our country that they were made a part of this legendary song. Though we could ask only a few of them few questions; nevertheless, it was a great honour to interview those celebs. Me: It is the greatest pleasure to meet you in person sir. I am your big fan. Tell me sir; what was the idea behind tweaking the original tune a bit (?) and coming up with a new one altogether? ARR: It has been my speciality to do so. Remember our National Anthem that I made for Fame Cinemas? It should ideally be of 52 seconds; but mine is much longer than that! Still people love it. People love me. Anything I make works; so will this. In fact, I may use my part for a Hollywood movie. Another Oscar you see. Me: You have given your voice for this song. What inspired you to do so? AB: I have given my voice for almost all the songs of various genres. When the makers of this video heard me singing Himani Boro Plus song – that Swaha! One; they immediately contacted me to sing something similar. I had only one condition – I should be the first one to be featured. They agreed (like they had any other option); and there I was! Me: your trio is playing altogether a different tune there. What do you have to say about it? SEL: We wanted our part to stand out. People say ARR is the best; but we rock. You listen to his part and listen to ours. The national pride song was the best platform to prove that ARR is overrated. Me: D, i must tell you; you are looking gorgeous in that video. How were you approached for this song but? D: (Giggling) they did not approach me; I approached them. I asked them to feature Ranbir and me; so that they will get a bit more publicity. Now this is a secret ok – since i am single at the moment; I am hopeful to find somebody for me. There are so many sportsmen, actors and musicians around. I will spread the rumours of my link up first and then break up. It is a great idea to remain in news for a month you see when your movies don’t work. Me: Shia-mak, good to see you after so many years buddy. You are the only person I can ask a direct question to. What is this video all about? And what are you doing there? S: The makers wanted a bollywood version of this song; that’s the reason all the big names were roped in. But the choreography has turned out amazing. The original song was missing that; and i have successfully created a fusion of classical dance and the western one. Me: SRK, your part in the song – isn’t it your favourite pose? SRK: Oh they used it in “Phir Mile Sur” too? No wonder I was invited for this party. I have around hundreds of copies made of that pose. Whenever somebody asks for a guest appearance; I send them a copy. So it is difficult to keep a track. I am sure technology took care of lip sync part too; if there was any. I could not ask any further questions to anybody. Nice one. Very hilarious. May be, inadvertently, you may have brought out the "real" truth or what they "really" think in their mind. You posed the questions like a professional press reporter. Kudos. Ha ha ha, Yes Neha I know you could not have asked more questions but on a serious note that is probably the real state of our elite group of people, who are featured in that video. God Bless India !! Neha,i think that i am very fortunate that i have not seen that new version till now and after reading this post of yours i am sure that i am going to keep myself away from it.Thanks . I don't think the new version is that bad. If you think it not as a remake but an original it sounds good. I liked the SRK portion. Who gave you that idea? I am sure, it is not yours. Hillarious!..this time it really gives a message as if India is bollywood only. I guess you should continuing interviewing other celebs also..
Well well.. you did ask interesting questions, and thank god you stopped Cause i have ahaving a laughter FIT ..
What will people do hain.. for a bit of publicity and cash on stuff..
May be it is worth commenting again. yu sure they didnt read this ? :D ..yu a pro reporter of a kind eh! Wonder why they had to do this again! The old song is still so strong and fresh in my mind ! Maybe i am just getting too old for the new generation ! But is his National Anthem longer than 52 secs? If so why has not the Govt taken action against him? I cant stop laughing....wonderful....kya imagination hain.....and I dont know if a National Anthem can be tweaked for entertainment purposes!! LoLs.... For Deepika i cudn't understand y she was the only one wearing a western dress in the entire song that too in rain, other was Sharukh in his usual pos(arms wide open).Thank god they leave it till there only and didn't add any bollywood masala further. lol! Loved the way you brought to light the thinking process of our celebrities! Your best post. Superb. Imaginative witty and sarcastic to core. Btw, employ some bodyguards bcoz they might whisk you away and make a hopeless redo of this wonderful post too. From whr u got this idea ya...can simply publish in Times of India its really good!! As always u had to target SRK...i know why...lol!! U were a bit mean to him...:))!! Ha ha ha ! Hilarious post, Neha...too good!! @ Vivek, exactly re..I can't see that video at all..
@ Kavita, please don' watch it..watch the older version instead..that's so much better..
@ Megha, wohi na, kyun phir sur mila? @ Gayathri, Thanks buddy for the compliment..no idea where Dipika is standing..maybe they shot her portion in some foreign location.. I guess tht explains her clothes too, right? @ Haddock, it is our fundamental duty to respect the national anthem..but if somebody does not respect it, we cannot sue that person..
@ neha, any other bollywood massala was left to be added kya? I don't think so..more or less, they added it all..
@ Lama, thanks a tonne dear..
As expected , the icing on the cake had to be Shah Rukh ... splendid piece of work ! Abhi-shake nahi aaya party mein apne paa ke saath?